You can get the end of exposure confirmation by monitoring the trigger singal in the flesh hot shoe of the camera. If you set your camera to 2nd curtain flash sync, it will try to fire the flash just before ending the exposure. The other method would be to control the camera using the bulb mode. In this case you know how long the exposure time is. The problem is, that you have a stiff exposure time not adjusting to the scene. im using this schematic and it works fine, but i want to combine this with a motion slider, but i only want to movve after the picture is done taken. this is crucial for for example a long exposure shots. how can I get a signal that the picture is DONE taken,even after long exposure on auto camera exposure ? I guess the focus or the shutter is accidently connected to ground permanently. Check the cables for short circuits. Was anyone able to figure out why the 7D freezes after appling this mod, I am very interested as I have upgraded to a newer camera body and want to play around with my 7D gen 1? I used the scheme and it's working great. GEO, I have the same issue, after using a home made shutter ONLY remote after say 15 minutes the camera freezes and no more pics unless i turn it off and back on again. It seems easy to damage expensive cameras with a home grown remote, so I won't be trying it on my canon 40d. Anyone have any spec info, or heard of solutions? I\'m thinking setting the camera to record, then using the pause function would provide the best result.. Does it need to have a resistor ? I made this trigger a couple years ago and it worked fine, but I didnt use it often. Reading the posts here iI concluded that a resistor is needed in order to not burn some internal components. To limit current (ammperage) to 30micro amp a resistor of 110K ohms should be used. Am I right? It would be put on the ground wire. Sorry, the pinout is correct, I was mistaken. I\'m really a beginner, when it comes to electronics, but I opened my cable remote controller (JJC MA-C for Canon RS-60E3), and there where written three abbreviations: GND (ground), PLS (? ), AF (auto focus). It seems that in the pinout picture on top of this page the tip of the connector is PLS, the middle part is AF and the last one GND. 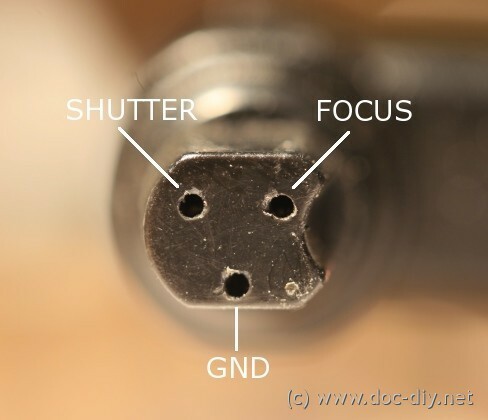 In my case it seems ...: tip of the connector = GND, middle part PLS and the last one is AF. When I connect with a piece of cable the tip with the middle part, the camera is taking a picture. Connection of tip with last part results in auto focus. I bought the N3 remote by mistake. Can I just replace the connector with a 2.5mm cable? Are they electronically the same? Hello, thanks for sharing this info about how remote controls for EOS cameras work. 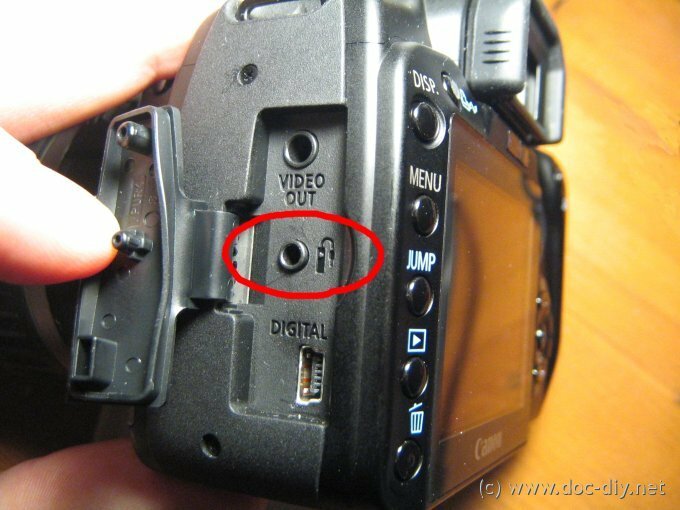 The first button (starting from the left) is the focus button; the second one is the shutter. The switch is for the shutter too, and it is useful with BULB mode. My 10d has the same voltages. I got a $11 timer for a 40d from oeverstock thinking I could just make an adapter but no luck. The focus pin reads -3.3 till it is pressed than it goes to 0 v and than it stays that way until the stutter is released (as long as you keep pressing it). I think I need to add some sort of latch circuit because the cheap switch I cut the plug from is a reed switch which makes the focus first and holds it where this one puts out one quick pulse. I used a 2.5mm jack from some cell phone (it comes with two rings). It worked fine - i was able to focus and shoot by connectings the wires, but after 30 minutes playing with it, it stopped working. I did not use any voltage (just connecting the wires) so I can't imagine burning something inside the canon. It looks like other people on thus thread had similar experience. Any ideas? Going to wire up a 2.5mm jack to fit the plug. I have a relay output from a controller that I plan to interface to. SHould be a simple wire of the shutter to ground and hopeully do not need to wire in focus. I plan to have it setup in manual mode and never sleep mode. That way if the trigger activates I will capture what in a consistent way. For a starting line of a race so I need consistent firing. BTW - All you hackers who are sourcing power to these pin be careful. The logic is pulled up by resistors internally in the camera. By sourcing a high on the ground wire your shorting voltage to the ground and this is a good way to damage items. You can source a high to the gate of a NMOS transistor. The source would be hooked to ground and the drain side would be hooked to the focus or shutter output pins. When you drive a high voltage on the gate of the transistor it will turn on and essentially pull the focus or shutter pins low. Relays can be used as well but don't drive voltage directly as it could interfere with the internal pull resistors and the sense nodes internally. Hi. I've have got canon 500d and I've tried to build this kind of remote wired shutter and it warks perfectly. But I connect only shutter wire, because I'm using manual focusing. But after a while the remote contron stop working. The camera does not react on the buttom. Did you ever encounter such a problem? I want to make my camera to shoot a single picture controlled by an IR LED when i push a button on my pic16f690 microcontroller. Does anyone know what is the protocol to make this? I wrote the code in C. I measured my RC-6 remote control. I measured 2 years ago the ON period of the LED IR and i think it was 60us. You should use two transistor in emitter circuit or better two optical coupler. The last solution is better cause it's hard to damage the camera. May you create an adapter which already includes the optical couplers - so you can't damage the IC in your camera. hello. is it possible to trigger from the digital output (5v) of the arduino? I was thinking i could just set up a simple circuit and use it to trigger the shutter... so if i sent a 3v into the ground it should work right? Ran into the strangest thing today - not sure which Canon models have this change, but definitely the EOS 7D. Voltage from camera ground to shutter is 3.3VDC, but from ground to focus is -3.3VDC. Not a big deal for mechanical switches, but a HUGE deal for FET's. Eg, the PocketWizard electronic release holds the focus at all times when attached. I've only seen this on the 7D, but why in world would Canon have made such a change???? Perplexing - any thoughts? If I ground the focus wire in manual focus mode will that prevent the camera from sleeping? I really need to figure out how to stop if from sleeping for an indefinite amount of time. I manufacture an "Intervalometer" that can be triggered by sound/light or in fact anything that can be used to trigger the shutter - IR beam included. Look at the post below yours. Using a light (or IR) sensor and a laser pointer (or IR LED) you can use the schematics presented there. Does anyone know of method of building/buying a remote trigger for Canon SLR that can be triggered by breaking infra-red beam or other remote method? National Geographic photographers have turned Canon 350Ds into camera traps, by engineering a remote release (triggered by passing animals). I can't find how to do this though. Any suggestions? Hi, I would like to build a shutter that can be connected to two Canon 400D. So when i press the shoot button both shoot a photo, but I'm not sure what to do with the voltages. I don't want to sum it and crash my cameras. How can I build this? I've had a quick scan on Ebay and could only see IR or wired remotes. The IR remote only work from the front of the camera are very limited in range and are of course single shot only. The wired remotes can do continous but you are limited by the length of cable. You can make up a wired remote in a few mins using a switch and 2.5m stereo plug. Cost about £2. I made a wired remote controller for my 400D with a motorola cable, but I added a 2 phase button, just like the shutter button: half way down for focus, all the way down for shutter. On One Shot takes one shot, on Continuous takes pictures until i let go of the button, and on Self-timer/Remote Control, the timer counts down. The Bulb function works good as well. The only problem is that i need to put it in a little box or something, and find a way to lock the button for Bulb. I think it's just a N3 version of the RS-80E3 trigger as used for the 400D and other three-digit EOS cams. Thanks for writing this, I've been looking for something like this for so long! Used a Motorola Handsfree - the one with the 2.5mm socket, and it works like a charm. The standard 2.5-mm plug shaft has a length of about 11 mm (0.43 inch). Is you jack connectror blocked? I used this and other sites in hopes of making my own cable release for my canon rebel xs (1000D). All sites mention using a 3/32 (2.5mm) stereo plug. However this jack is too long and does not fit my camera. Is there a shorter one available? Thank you for this interesting information about the EOS. I would be grateful to know whether other brands have it on any of their cameras. I suppose the circuitry using the 555 timer switch should be the same as per the one you shown for your 400D? I am wondering where I would be able to get the socket to connect to my camera? is the 3.3v really needed? I had a simple remote for my 450 and 1000d and they didnt use batteries. Second can you also use a transistor to switch? I was thinking about making a kind of slave (flash) for lightning fotography. If you hold down the shutter-button only: The camera focuses first and than shoots if the focusing was successful. If the camera can't find the focus (too dark, object out of focal range...) no image will be taken. You have to hold down the button until the focus has been found, it may take a second for bad light conditions. You can also focus first using the focus button and than additionally press the shutter button to release. This way you can control on what the cam has focused and refocus if necessary. If you are in manual focus mode, the cam will trigger immediately when the shutter button is pressed. I would like to know how do I use the DIY remote controller. 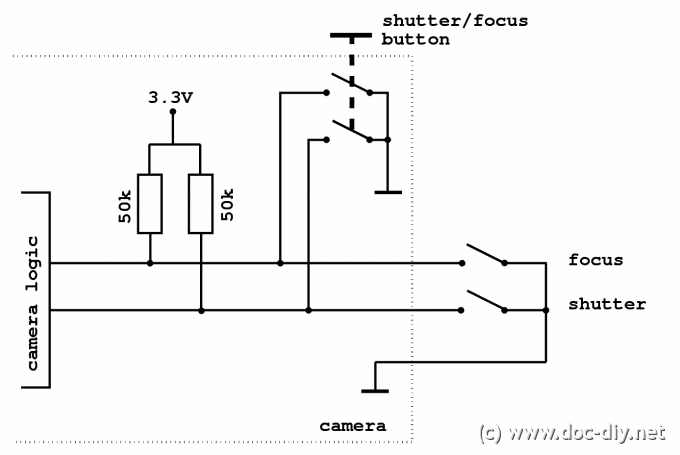 First focus and then prss the shutter(both pressed) or focus and then press the shutter(only single button pressed)? Both the 20D and 1D3 have an N3 connector. I guess the characteristics of both cameras are the same because both use the RS-80N3 trigger. I think it's just a N3 version of the RS-80E3 trigger as used for the 400D and other three-digit EOS cams. I liked your article on remote release. I was going to make a dual verision that would trigger a 20D and a 1D3. Do you know if the voltage characteristics of the cameras are the same?